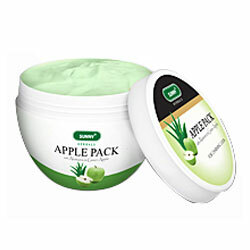 Bakson's Sunny Herbals Apple Pack Imparting a flawless, youthful & healthy glow. Imparting a flawless, youthful & healthy glow. Improves complexion & rejuvenates your skin. with Aloevera, Almond oil & Green apple. Enriched with the goodness of Aloevera, Almond oil and Green apple, an excellent source of vitamins A, B, and C, this face pack removes dirt and harmful toxins and rejuvenates the skin, imparting a flawless, youthful & healthy glow. Wash face and pat it dry. Apply a generous amount of Apple pack on face and neck, leaving the area around eyes. Wait for 15 minutes. Rinse the face with fresh water.